Last night I cooked what tasted like the most incredible chicken I have one ever made & two have ever tasted in my life. 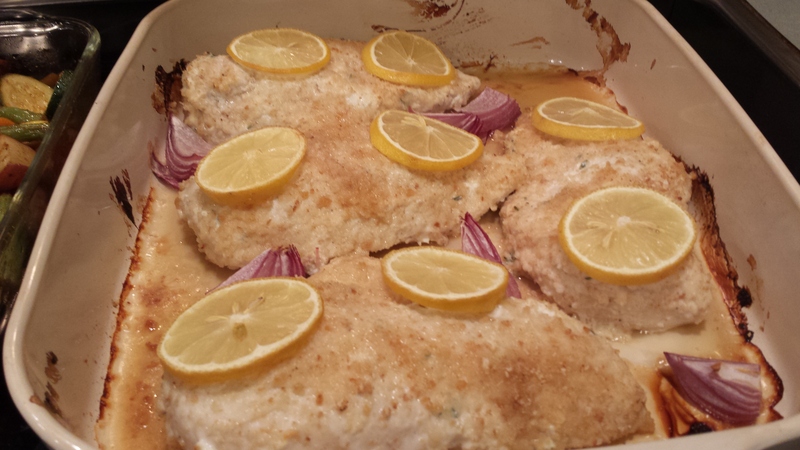 I found this Garlic-Yogurt Baked Chicken recipe the other day on http://www.diethood.com and thought I would give it a whirl. I haven’t cooked in a little time so I wanted to make something delicious for dinner on Sunday. Life throws you twists & turns and sometimes your hobbies have take a backseat to life. I’m lucky enough to have some amazing twists & turns going on in my life & I couldn’t be happier about everything. This chicken just made me that much happier. True story. SO GOOD. I like to always have a positive outlook on life. I mean really though, who has time to be negative. We’re given this one life so why not make the best of it? I try to always find a positive spin for everything, even things that don’t seem so positive. So I look at it as I haven’t had the opportunity to cook in a week or so, which is sad, but because of that week long wait I was able to find my new favorite chicken recipe to drool over for a long time. If you get an opportunity to make this recipe, I really hope you enjoy it as much as I did! Season each chicken breast with salt/pepper, front & back. Place in a baking pan & set aside. Combine yogurt, garlic & thyme in a mixing bowl until well combined. Smear the yogurt mixture over each chicken breast, front & back, making sure that every piece of chicken is covered. Cover the baking pan with yogurt covered chicken with plastic wrap. Place the pan into the refrigerator for 4 hours. After chicken is done marinating in the yogurt mixture remove from the fridge. Grab a clean baking dish to place the chicken in. Remove any extra yogurt mixture from the chicken by gently shaking each chicken breast. Clumps should fall off. You want the chicken to remain covered but just lightly coated. Discard any leftover yogurt mixture. Sprinkle bread crumbs lightly over both sides of chicken. Slice up lemon & place 1 to 2 slices onto each chicken breast. Slice up the 1/2 onion into quarters & position around chicken. Bake for 45-50 minutes until chicken is done. Serve immediately.